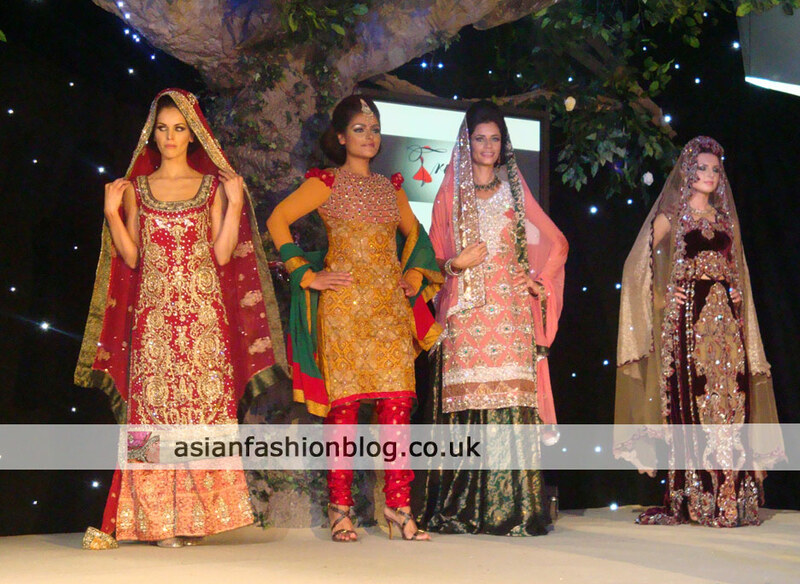 This year's Asiana Bridal Show took place at their usual venue, the Rivebank Plaza in London, on the 30th January. I made the trip from Manchester to London just for the show and I have to say it was worth it! There's so much to say about the event, from some of the lesser known fashion exhibitors I met, to the lack of asian models on the "enchanted forest" catwalk. I'll be posting my full reviews of each fashion show designer very soon, but here's a first look/preview from the catwalk, starting with my two favourites - Ziggi Studio and Ekta Solanki. 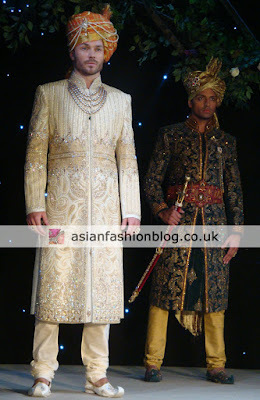 As a big fan of Ziggi Studio I couldn't wait to see their new 2011 collection and was instantly blown away when they started off their section of the fashion show with the green and gold sherwani (seen on the right in the photo above), modelled by Asiana Magazine veteran Cameron Khan. There was a very regal look to this collection. I was impressed by Ekta's collection not just on the catwalk, but up close in her exhibition space. It's the colour combinations which you'd think wouldn't go together, but they do, and the big bold embroidery patterns. My favourites were the blue and gold outfits. I knew very little about Truphae before this event, and I believe this event was the launch of their brand. I didn't really feel there was a theme to their collection as the outfits didn't seem to go together. Individually though, there were a few outfits which I liked the look of. Gul's Style closed the show, and they were one of the few fashion show designers who didn't have an exhibition stand where visitors could get a closer look and touch the outfits for themselves. They had some pretty outfits though, including the finale piece seen above which one of my non-asian work colleagues described as "a technicolour dreamcoat". Khushboo's always put on a good catwalk show, but like Gul's Style I don't think they had an exhibition stand so I didn't get a chance to see for myself what their customer service is like! This was the showpiece of their catwalk show - the necklace was impressive (if you could call it a necklace - it was so much more!) although probably very difficult to be the person wearing it at a wedding/party - imagine people trying to greet you with a hug/kiss whilst wearing that! However I'd love to wear the headpiece and play princess for a day. As well as featuring in the main fashion show, Mongas also had a mini-catwalk in their exhibition space which was a nice touch. I had high hopes for Sonas Couture - having loved what I'd seen on their website and in the magazines. Sadly their fashion show outfits were a bit hit and miss for me. I liked this gold outfit though, especially the detail on the sleeves. There were a few comments made about the ethnicity of the models at this year's fashion show. The first segment by Roshan's was a stream of non-asian models, and sadly it stayed that way for most of the event. I counted 3 asian models out of all the girls (including pakistani model and recent Asiana Magazine cover star Mehreen Syed) and just 2 out of the guys. Having been to the Asiana Bridal Show before, I knew from experience that to get a decent seat for the fashion show you have to start queuing up early - and if you're at the front of the queue, somehow a stream of people always manage to get "priority" entry before you. The same was true this year, and even though I had my seats reserved (big thanks to Manni at Asiana), the majority of the front rows were reserved for sponsor's and exhibitor's guests rather than the public who had paid an entry fee to see the fashion show, which I thought was a little unfair! Did you attend the exhibition and/or the catwalk show? What did you think overall? What about Kiran Khan? How was her collection? i really loved and enjoyed the talent at the asiana bridal exhibition, it is the first ive been to in london and compared to the asian woman wedding exhibition in wembley stadium, it kiked bums! Thanks for your comment - I must admit I browsed the exhibitions stands quite early in the morning when they were less busy so I didn't get stuck in a people-traffic jam but having seen how many people had arrived a bit later on I can understand imagine how crazy it got on the exhibition floor. I do think this hotel is a great venue, but I think for future events there needs to be a bit more planning in terms of layout to ensure easy movement for people. Where were all the asian models at this event. 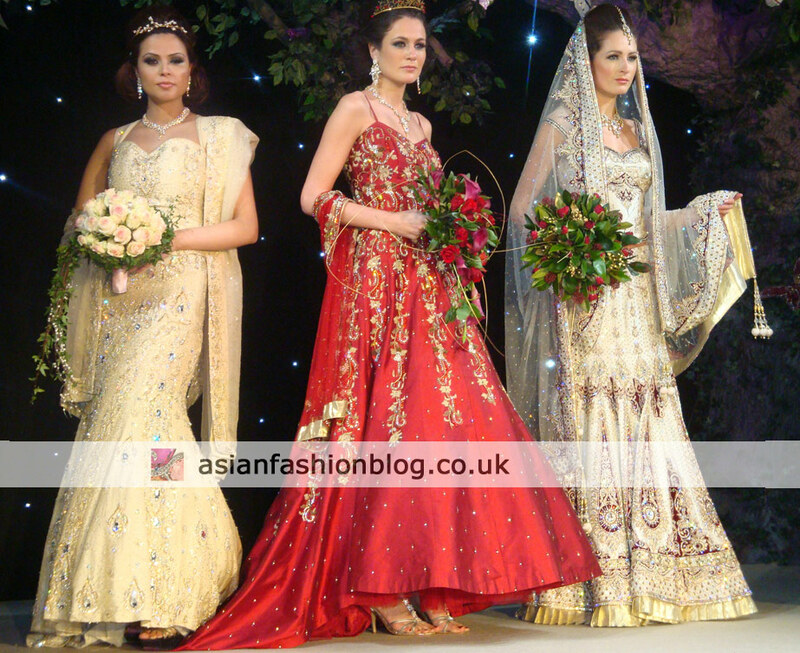 Its an asian bridal show. The clue is in the title. The models were pretty but why didnt they use asian models? Asiana are always being criticised about. Its stupid. Its not like there isnt enough asian models around. The editor of the magazine needs to support her own too. Typical asian mentality. thank you for highlighting the lack of asian models on this catwalk. I didn’t go but everyone I spoke to mentioned this. do you know how hard it is for an asian model to break into mainstream modelling? when do you see many asian models being featured in western shows or even london fashion week events. 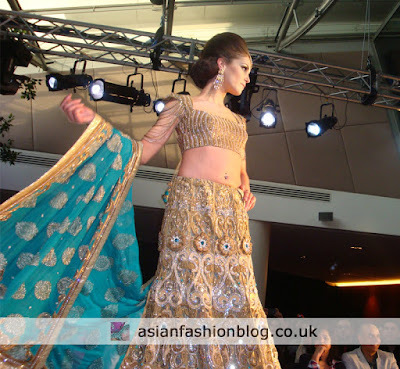 asiana is a big show which provides an opportunity for asian models to shine. 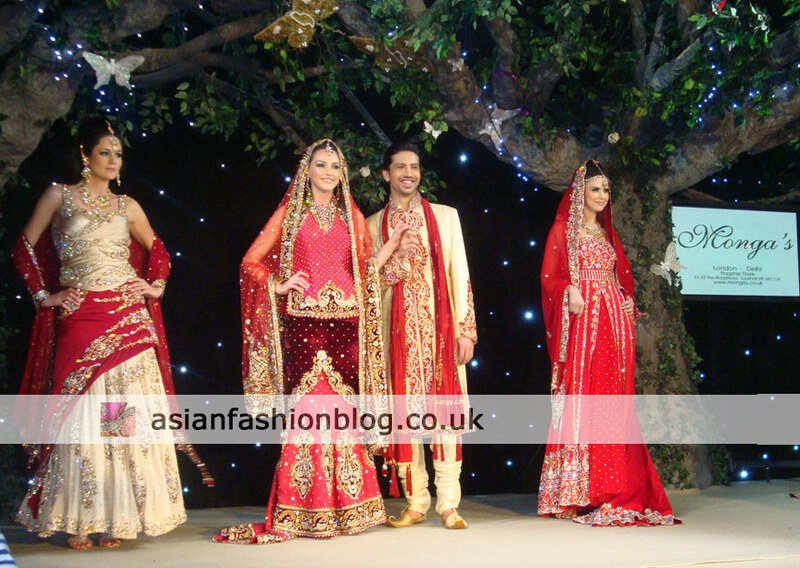 its an asian wedding show, the audience is 90% asian, the brides/grooms to be are asian, the designers are asian, the people purchasing and interested are asian so what arent the models asian? there are so many tall slim good asian models that can do the same job if not better as they are already accustomed to asian clothes and no how they should be presented. my friend told me the western models were good but they didn’t really know how to bring the asian class when showcasing the clothes. they danced around in the too much. im not being cruel about the models that they did use. everyone says asian women bride show was bad but atleast they use asian girls. and have a better venue! "A sherwani will always look better on a indian or pakistani man as it was made for them not english men"
I have to disagree with the above statement, firstly I do think there should have been a few more asian models in the show - it would have been nice to see an equal mix of both, but I don't think the outfits looked any worse on the non-asian models. Turn the tables and imagine if someone told you that you should stick to asian clothes because western clothes will always look better on a white woman - not very nice to hear it that way round is it?! You need to consider that a lot of people have mixed marriages where the brides and grooms are from different backgrounds and ethnicities, and you will see some people from non-asian backgrounds wearing these clothes for their weddings. Personally I thought the male models were great and they carried off the sherwanis and regal look of the Ziggi Studio collection very well. Interesting comments here. As an established show producer and creative director, I do believe that its important to have a good balance of asian models in a show. 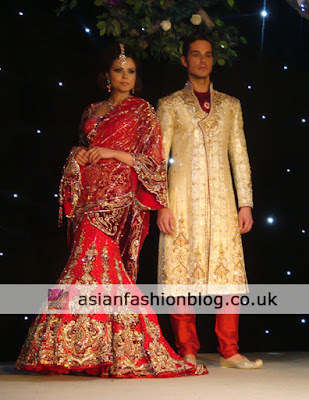 And yes this years Asiana bridal show did lack the appropriate models. I myself in the the past have casted non asian models for my shows however I do ensure that they are trained well and taught how to carry the clothes. The models may have 'all looked the same' as someone commented earlier, and that's a lot to do with the lack of styling, the draping was pretty much the same for every outfit each model wore. My and team and are meticulous about the detail and styling... Proof is in our shows. I've always found that some girls will get the opportunity to catwalk bt they don't take it seriously & let girls who are determined to get into it get passed over! Similar thing happened with me asian scene didn't give me a chance as I was TOO DARK (!!!) BUT I got good work on english side! I thought they all looked fab from the pics asian/ non asian they suited the outfit & did carry them well. No one wants to see a dress modelled catwalking by a 5'3 dragging the dress. Love love love ekta solanki's collection...more pics please!!!! luuurve ektas clothes, stunning and ziggi wow super stuff great post!! based on the pics i have seen on this website over the years i decided to make a trip down to the fashion show this year. I agree with Nazma - my biggest gripe was that the seats were all the same level and therefore you couldnt see the full outfits! They should have had seats like they do in theatres - raising higher the further back tehy went so at least your view wasnt blocked by someones head! Other then that as it was my first experience of any catwalk show i thought it was still very good (my non-asain friend did however comment on the lack of dark skinned models representing the target market). My absolute favourit was Kiran Khan - her collection was pastel based ...very spring/fresh feel and stood out to all the reds and traditional colour palette on teh catwalk. 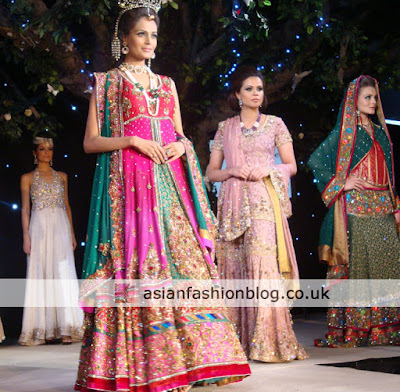 It felt pakistani high fashion. Long tops/long jackets etc. i spoke to her afterwards and she was really nice and genuine. the actual exhibition was chaotic but that was due to it being peak time, i felt there were too many london based companys and as i am based up north i wasnt interested...there were too many photographers/makeup artist stands and all the models representing the makeupartists had the same makeup look! Without the catwalk show it wouldn't have been worth it as i went to the few designers stands whose outfits causght my eye. However what they had in the show was not on the stand. As for Ekta's collection it was the same thing i saw last year in the magazines (same with Guls) however Ektas prices started from £2500 up to £6000 for one of the outfits in her stand!dont asians know its a recession! defintily beutiful but OTT and definitly pricey. i would go to another catwalk show but only if the seats were reserved (i rather pay more if i know i will get a good seat) or at least if they sort out the way the seats are placed! In regards to another exhibition then no, i probably wouldnt unless it was specific to my local area. next time i will just wait for the pictures to come up on this website :o) please put up the kiran khan pictures as i wanted to make an appointment to see her but wanted to show my family first! Agree with all the comments here, Ekta's collection and exhibition space was by far the best. Yes she is expensive (prices start from £3000 depending on the design) but the quality of her clothes, fabrics, embroidery and service is brilliant. Her designs are unique and fresh something every bride wants to see! The rest of the collections were so sparkly and all seemed to look the same im afraid. 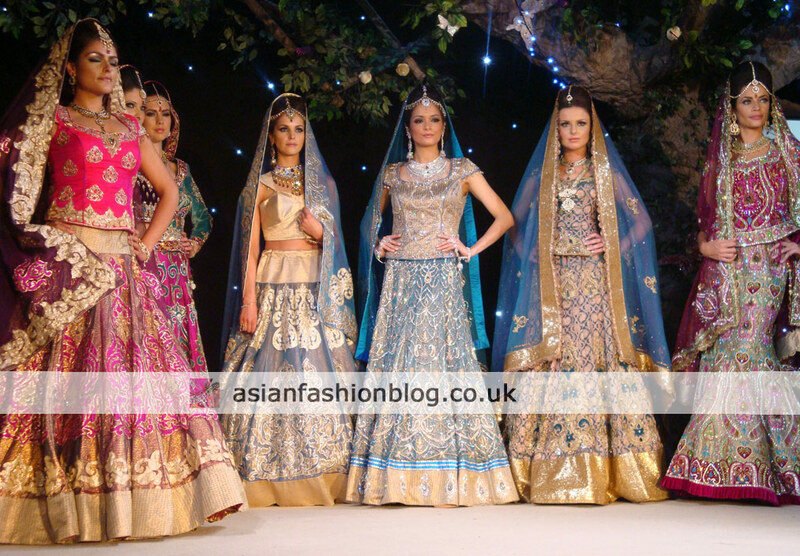 I absolutely loved Kiran Khans collection I thought it was one of the best designer catwalks I have seen.I also wish there were more Asian models used it would have been more reflective on the clothing and the market they are aimed at. In india and pakistan they are able to use asian models and they dont seem to have qualms about them so I dont know why asiana did. I went in the line for the fashion show early about 40 mins. Only to find seats reserved and children and uncles sitting in front in reserved seats (sunrise radio, jaguar etc). Surely these seats should be for brides-to-be who want to buy outfits and are interested in them. I actually feel I wasted my money and preferred the Asian wedding exhibition in Alexander palace (because the fashion show was repeated and I actually got to sit near the front to see the actual cloths ). Sure the catwalk was nicer at asiana but what was the point when you could hardly see anything. I totally hated the layout of the stalls and overcrowding at the show it could have been better planned. However I was dissapointed with the seating/queuing arrangements at the show. I queued for over 30 mins near the front of the queue when one of the organisers gathered a big group of family and friends and led them to the front while we were still left waiting. I suggest that the seats should be numberes which would reduce the queues and tiered/staggered so everyone can see. Otherwise I was totally impressed with the models (asian or non-asian). I thought they were very professional and worked very hard. Can't wait for more pics to be put up. I absolutely LOVE Gul's style - so fresh and vibrant! Great Catwalk all round, I feel people were there to see the collections and feel that the models carried off everyone's collections well. Personally my favourite was Sonas collection. The first gown blew me away and I agree, the gold outfit was simply stunning. Nayla, I think Sonas collection was the best. Her boutique also has amazing ranges whereas Ekta Solanki has a tiny studio. Ektas cuts look very repetitive and overpriced!! hello! I am a fashion designer I would love to participate in Asian bridal exibition, to explore my ideas. Idon't have any showroom yet but i am planning to have my own fashion studio soon. so b4 i start i want participate in a Asian bridal show.my request for Nazma please if you can give me moredetail about the show.